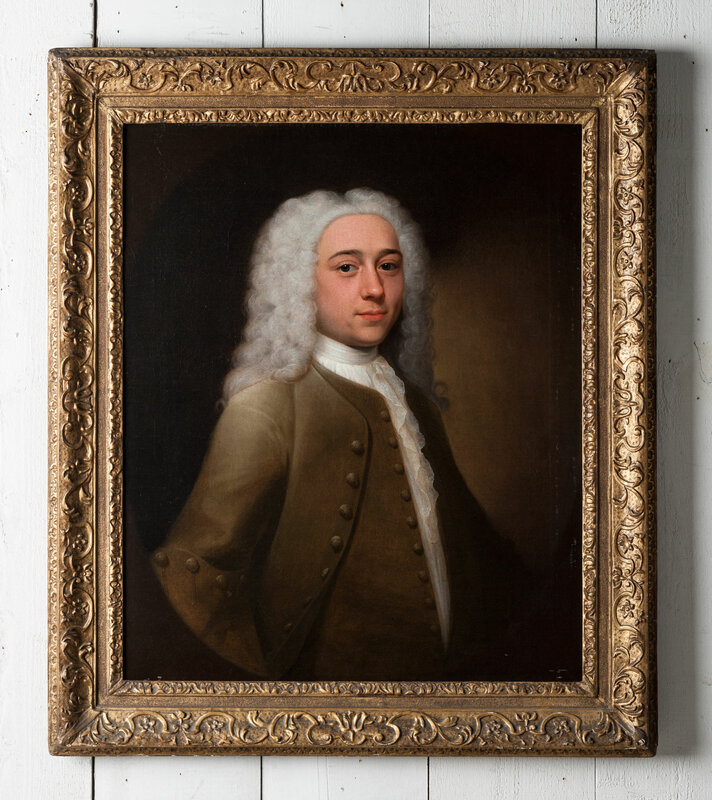 A fine portrait of a young man from the beginning of the 18th century, painted in a feint oval in oil on canvas and within a finely carved and gilded Lely portrait frame of the period. Signed lower left in script 'HEINS' and dated 1730. English circa 1730. Dietrich Heins was born in Germany, 1697. He seems to have followed King George I from Hanover, who ascended the English throne in 1714. Heins settled in Norwich, East Anglia around 1720. From this date until his death in 1756, Heins built up a fine reputation as a portrait painter and painted many members of prominent Norfolk families right up until his final year. He was commissioned in 1732 to paint a portrait of the Mayor of Norwich, Francis Arnam and also the previous year's Mayor Robert Marsh. After this Heins received regular commissions to paint Mayors and other civil dignitaries. The vast majority of his sitters were residents of Norfolk but also of neighbouring counties, painting people living in Cambridgeshire and Suffolk. He may also have received commissions from the West Country as he is considered to have painted the portrait of Mr Gerard Hartopp, Govenor of Plymouth and a collection of portraits of the Enys family who lived near Penryn in Cornwall. The provenance of this portrait suggests it may be from this West Country period. He is represented in the Castle museum, Norwich, Felbrigg Hall (National Trust) and Cambridge University. This work measures 25 inches x 30 inches.